Hello huddah, hello fadduh, here I am at Camp Tesomas. Camp is very entertaining. They say will have some fun it stops raining….. I know it doesn’t rhyme, but you might remember the song from the 60s called “A Letter from Camp” by Allan Sherman and Lou Busch, which parodied a series of letters, mailed home complaining about camp. Well, it is not raining, in fact, that was last week, but this week has been amazing – warm days and cool nights. As I write, it looks to get warmer Wednesday afternoon and the health officer warned all the scouts to stay hydrated – and not with slushies! 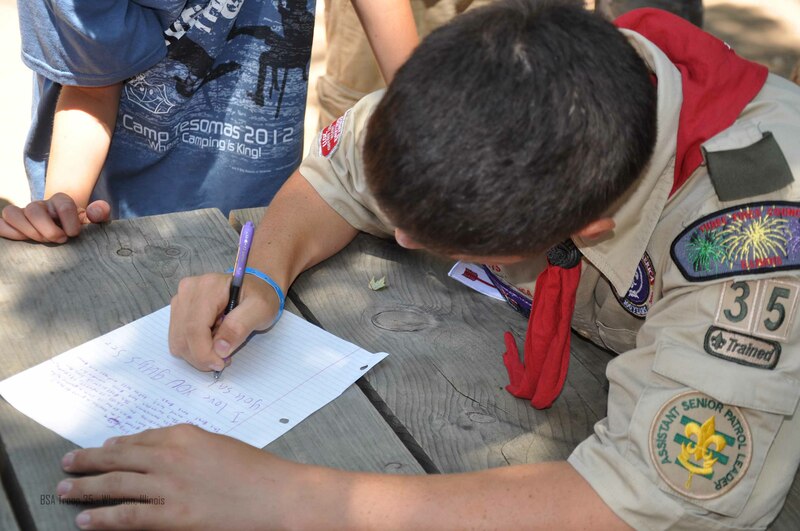 Before lunch yesterday, Kevin and Don encouraged the scouts to write letters home – they should be arriving in mailboxes next week, I know you’ll treasure their words as I do. We have received several letters here and it was heart-warming to watch them tune out their peers and read their letters. Thank you for the letters, I know it means so much to them. It has been fun here and every scout I have spoken with says they’re having a great time. I couldn’t agree more; I am having a great time, even when the going gets tough, it is a great time here. The scouts are eating well and enjoying the time to get to know and grow together as a team. The nine first year scouts are having a blast and growing together to be the next group of future Troop 35 leaders. John, Kevin, and I were reminiscing the other day of how far our own kids have come since our first visit to Tesomas together in 2009. John and I arrived at camp three years ago with eighteen first year scouts. Ten of those scouts are back again at Tesomas for a fourth year and looking ahead to a fifth, sixth, or more visit. Eleven of the scouts are active in the troop and the eleventh will be back at Tesomas in July for scuba training, and I know they ALL have their eyes on eagle. John, Don, Eric, and Carl have been working hard shepherding kids to and from Eagle Quest and those scouts have made huge strides this week with their scouting skills. Yesterday afternoon, I was working at camp preparing the sauerkraut (the Wisconsin state vegetable) with Kevin and several scouts came bounding back to camp to show me their Fireman Chit – the BSA license to start and supervise campfires. They were so excited; I could tell they can’t wait to share their experience with you. And this comes on the heels of them earning their Totin’ Chit – the BSA license to carry and use a pocketknife – on Monday. These kids are brimming with excitement and you might wonder what happened to your scout over the past week, but they have made huge steps forward – each and every one of them. Tuesday we prepared dinner at camp and invited staff members to join is. Dan and Davis joined us for a dinner of brats (Wisconsin sausages), sauerkraut, chips, and fellowship. Don cooked the brats over the fire, Kevin and I made the kraut, and many of the scouts chipped in to help, setup, and cleanup. It was a good night and great food, but it was even better because it we shared it with friends, new ones and old ones at camp. After dinner, Dan provided dessert – popsicle pushups – hence several orange, red, green, and blue tongues. Once the scouts were finished cleaning up – we shooed them out of camp to the program areas – the waterfront, the main camp, shooting sports, the climbing wall and zip line, and the biking trails. They all had a great time playing and being kids. When Eric, Carl, John, and I met the first year scouts at the trading post for their night sky evaluation, you could still feel the energy and excitement. By the time, we were finished with the night sky the scouts were ready for the walk back to camp and sleep. Wednesday is a big day, no a HIGE day, it mid-week and the Order of the Arrow Ceremony after dinner. It is half way through the week and all the scouts have accomplished so much, with much more to go. Today is already a great day and though it seems impossible, tomorrow is gonna be a million and six times better. Making the days Count, one day at a time, building memories to last a lifetime. This entry was posted in Camping, Citizenship, Leadership, Recruiting, Scout Values, Scouting skills, Uncategorized. Bookmark the permalink. we had a great day yesterday – I can tell from the stats people are reading and checking it out… if you have a neighbor or friend who’s boy is in cub scouts please share.. this is one of our greatest recruiting tools, immediately after your son! More to come today!